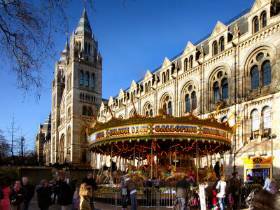 The Natural History Museum in South Kensington has to be one of my favourite places to visit in London. I never tire of seeing the exhibits held within its magnificent walls. I still get a rush of excitement when I start to see the building as I bound up the tube station steps two-at-a-time onto the street. I have many treasured memories from childhood trips with my school as well as with my parents. Today, I even caught myself smiling at a group of kids craning their necks back in awe to gaze up the dinosaur skeleton in the front entrance. We’ve all done it. This afternoon, the Northerner and I ventured out to face the bank holiday crowds. Probably not the smartest idea for two people who have a low tolerance for pushing and shoving. However, we managed to fight our way into the queue of The Veolia Environnement Wildlife Photographer of the Year 2010, hosted at the museum and waited with remarkable patience to be admitted. It’s a custom that I buy the new wildlife calendar for the coming year that feature some of the winning shots. The exhibit kicks off in October and usually runs until around March; but I failed to get to the show last year because of university, work and a hundred other excuses. So it was an absolute imperative that I drag the Northerner there with me today as I don’t have a 2011 calendar. I know we’re only three days into the new year, but I already have a few important engagements I need to write down and remember; using post-it notes around the flat makes me look like some sort of nut-job. My memory definitely seems to be getting worse as I get older, or maybe that’s years of alcohol abuse finally taking its toll! After about half an hour of queuing we managed to get in, but it was very busy (there’s a surprise). The origins of the competition stretch back to 1964, but it was not until 1984 that BBC Wildlife Magazine and the Natural History Museum joined forces to create the competition that it is today. As usual there were some incredible moments captured on film but there were also a few curve-balls that instinctively made me furrow my brow and say out loud….erm….why? This year’s winner was unusual, but definitely deserved. It was taken by a Hungarian, Bence Mate. His shot is of leaf-cutter ants in the Costa Rican rainforest. Bence’s winning photograph is from the competition’s Erik Hosking Award given to the portfolio of six images that represent the best work of young, talented photographers between the ages of 18 and 26. This award has not been given since 2007, when Bence last won it. I’ve been obsessing, mostly scientifically, about non-human primates for about a year now….so I wanted to see how good my knowledge has become in identifying different species. There wasn’t a hell of a lot of monkeys or indeed apes featured, but here are two photographs from this year’s competition that I absolutely love. The first is from the Gerald Durrell Award for Endangered Wildlife. This award is given to the most memorable image which captures the unique character or spirit of the subject. The species featured must be officially listed in the 2009 IUCN Red List of Threatened Species as critically endangered or endangered, vulnerable or near threatened at an international or national level. Tim Laman (USA) has photographed a western tarsier (Tarsius bacanus). Tarsiers are named for their special elongated tarsal bones. They have huge eyes and each one is bigger than their entire brain. They can rotate their head almost 180 degrees in each direction like owls. All tarsiers hunt at night and exclusively for animal prey (cockroaches; crickets; other insects; reptiles; birds; and bats). They are nocturnal and one species can be found in the Philippines and the other four are currently recognised in Indonesia. Laman’s photo is called Night Eyes and was taken in Borneo in the Danum Valley Conservation Area, Sabah. These primates are very elusive and Laman says it’s taken him 20 years of searching to finally capture one on film. The second photograph is of the golden snub-nosed monkey (Rhinopithecus roxellana) by a child from China! Yes talk about overachiever, clever sod is also under ten years old. Let’s hoped Haijun Pei hasn’t peaked too early. He took the photograph when he went with his parents to China’s Qingling Mountains, Shaanxi during winter. These beautiful monkeys are adapted to the longest winter and coldest temperatures that any primate withstands except humans. They mainly eat fruit; lichen; as well as buds; seeds and bark. I highly recommend you get over to the museum before the show ends on March 11th 2011. A tip for you though, book your tickets on-line, it’ll save you a lot of time and agro queuing. Prints of most of the photographs are also available to buy. Hi Matt, the winner (Mate) really did suffer for this art. Apparently he spent quite a few hours lying on the ground to take the shot. As a result he was covered in chiggers – digesting mite larvae! They burrow into the skin and look like tiny black spots, until they hatch. I met a PhD student in Budongo, West Uganda, in July last year who also suffered a similar fate by wearing flip-flops in camp. Her story meant I even considered sleeping with my jungle boots on. I’ll have to go this weekend! Yes, definitely go! The weekends however, are rammed, so book on-line first; then you don’t have to queue and you can go straight to the front like Royalty! Laman’s photo is called Night Eyes and was taken in Borneo in the Danum Valley Conservation Area, Sabah. Thanks for sharing this….